The festival is originally a celebration of the nine sons manifested by the Father Emperor Zhou Yu Dou Fu Yuan Jun and Mother of the Big Dipper Dou Mu Yuan Jun. The Dou Mu Yuan Jun, or affectionately referred to simply as Dou Mu, holds the Registrar of Life and Death. 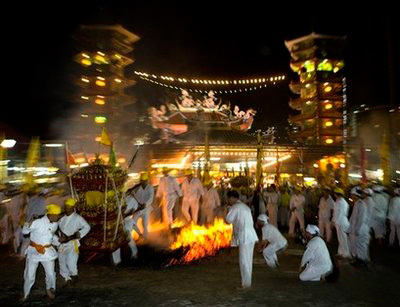 It is a festival which Taoists believe, can help to prolong one's life, eliminate calamities and absolve the sins and past debts as we worship the Northern Dipper stars. Many people are confused with the origin of the Nine Emperor Gods. There are many folklore pertaining to this festival, for example, that the nine emperors were originally pirates who behaved like Robin Hood of the west, robbing the rich to give to the poor. Another story is about the rebel who was beheaded for wanting the restoration of the Ming Dynasty during the Ching Dynasty. This festival falls in the first to the ninth day of the Ninth month of the Chinese Lunar calendar. During this period of time, there are a lot of makeshift stalls in Penang, decorated in plain yellow colour, selling vegetarian foods to believers. According to tradition, we need to be very 'clean' to qualify worshipping the Nine Emperor Gods, hence the vegetarianism for either three days or throughout the duration of the nine days. There are also makeshift altars during this time. From the first day, believers will flock these altars to offer joss sticks and joss papers, and some may ask for boons in front of the Nine Emperor Gods. In most cases, the request for boons will be accompanied by a promise of payment, usually in the form of becoming a vegetarian for the full nine days duration every year for the rest of the life if the boon is granted, depending on how serious the request is. It is not easy to become a vegetarian for the purpose of the Nine Emperor Gods Festival. All utensils need to be new and clean, and even the drinking bottle or cup must be new too. No eggs are allowed for consumption, and milk is also a forbidden item. Coffee addicts will have to purchase a different type of coffee which is 'vegetarian' and not the normal coffee that we have every day. There are also a lot of taboos for the prayer to the Nine Emperor Gods. A menstruating woman is never allowed to enter the makeshift altars, much less to make an offering to the Nine Emperor Gods. The body must be clean, and vegetarians during these nine days may actually abstain from cigarettes even if they are addicted to nicotine during the normal days. No alcohol is allowed, and in many cases, the worshippers will abstain from sexual activities during this period of time too. In short, it can be concluded that the worshippers will actually adhere to the precepts fully during this time. It is generally known that the rain pours easily during the nine days. The rain becomes more apparent during the invitation and during the sending off of the Nine Emperor Gods, but the event is never short of people who follows the procession to the Jetty. The ninth day is a very much celebrated event, with mediums being in trance and possessed by the powers of other gods, usually Prince Nezha. These mediums, during their trance, will walk along the streets with knifes and spears pierced through their mouths and body. There is not a single trace of blood or pain on their face, and they even go as far as to allow photography with worshippers and to give blessing items to those they come across. There can be rain, and yet, the people, usually dressed in yellow, are all fully motivated by their believes and total trust in the Nine Emperor Gods that the rain is no hindrance for them to follow the procession. The sending off of the Nine Emperor Gods always include a huge paper ship specifically built for the purpose. When they reach the jetty, a ritual is conducted to say goodbye to the Nine Emperor Gods for that year, asking for blessings and protection by the Nine Emperor Gods. Paper ingots and the specially built paper ship is then burnt and put into the sea at the end of the jetty, burning gracefully as it sails off as the ritual comes to an end. In the hearts of all the worshippers, it is hoped that their wishes will come true, and that everyone will have a healthy and peaceful year. Life goes on, until the next year when they invite the Nine Emperor Gods once again. This entry was posted in Tourism & Leisure and tagged Chinese Lunar Calendar, George Town, Georgetown, Nine Emperor God Festival, Nine Emperor God procession, Nine Emperor Gods Festival, Penang, procession by admin. Bookmark the permalink.